A couple of generations of left-of-center activists were routinely referred to the often effective, but ethically problematic book Rules for Radicals by Saul Alinsky, whose name has become a bogeyman in right-of-center politics. 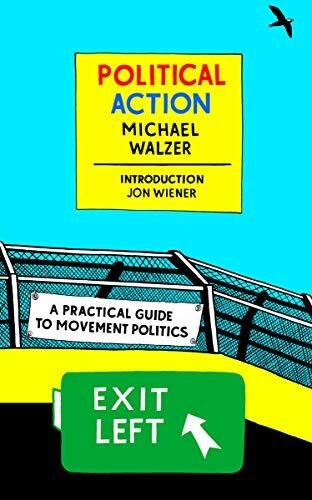 They should have been pointed to the original edition of Political Action by then 25-year-old Michael Walzer, now a distinguished scholar with over two dozen books to his credit that examine the philosophy and ethics of politics, war, and civil society. What is the genius of this book that allows it to leap across two centuries with continued relevance? It is the author’s gift of being able to analyze a range of options for each aspect of citizen activism, alert us to the strengths, weaknesses and dangers of each option, avoid giving pat answers, and asking us to make the best choices possible in any given situation. It is a deeply real and human book. Walzer understands that most people have to live their lives, show up at their jobs, pay their bills, and so forth. The citizen activist is all in, but can’t expect everyone else to be all in without driving them away. The activist needs to know how much to ask for and how to ask for it, how to maintain engagement, what victory is achievable and what is not, and when and how to pass issues to elected politicians to bring them across the finish line. The reason this book continues to be immensely readable is that, like Machiavelli’s The Prince, it largely avoids using issues of its day (1960s, early ’70s) as case examples. Instead the reader, such as this one, is left to recognize the various scenarios and plug in his or her own examples drawn from their own life, times and knowledge of history. A contemporary reader working through the options, risks, cautions, errors, transitory victories, setbacks, sequels and so on, will write in the margins “Occupy,” “Parkland,” “AOC,” and any number of the local groups, leaders, and movements with which they have been involved. Only in the preface to this edition does the author refer to specifics of his own which, while understandable, perversely may limit the book’s accessibility in another 50 years. Walzer made the courageous choice to not edit the original work. This risked the contemporary activist, who is less likely to be from the dominant white male sector of 1971, to feel excluded from the narrative. Surprisingly, this doesn’t appear to be an issue. For one, Walzer seems to have had a gender sensitivity that was ahead of the general and political culture. He observes that “The subordination of women, especially older women, in the new party or movement is only one more example of their position in the old society.” He notes they are the most seriously underpaid, as we are still striving to correct. At least to this reviewer’s mind, there should not be much to off put minority activists. He does, however, correctly recognize that the chapter on media relations and use needs to be emended and supplemented by contemporary texts. Walzer is full of cautions to activists themselves. There are many ways in their zeal, their frustration, their use of the movement to create their own sense of identity, that they can undermine the causes to which they are dedicated. This is a rare use of “tough love” toward those who would presume to jar the world into improving. Beyond these cautions, the book is full of strategic choices to be made and tactical methods to develop and hone. It is a handbook, but not a formulaic one. Each chapter can be the focus of productive dialogue as activists struggle to form their group consensus on objectives and on structures for pursuing them. When young contemporary activists were exposed to the original edition of this book, they recognized its value in how to go beyond the petitions and rallies they are adept at generating through social media. It is they who encouraged the reprint. Walzer is providing a road map for the long hard work required to reform institutions and societies. It is this “toiling in the trenches” that make the more drastic and usually flawed attempts at revolution less attractive or necessary. Ira Chaleff is a Visiting Leadership Scholar at the Moller Institute, Churchill College, Cambridge University, England, and the author of The Limits of Violence: Lessons of a Revolutionary Life.